When the Union Pacific Railroad crossed the Plains, large numbers of workers, hangers-on, and purveyors of vice congregated in temporary boom communities known as "Hell on Wheels." With few towns in existence along the Union Pacific line, there was little for the men to do, so professional gamblers, saloon keepers, and prostitutes filled the void in entertainment, building a reputation that lasts to the present. By no means, though, did all activity revolve around vice. In longer-lived towns, literary clubs, religious gatherings, theatrical offerings, and other activities were common. Two communities coexisted in the Hell on Wheels towns: the raucous railroad builders and their followers and the businessoriented class who hoped to remain and build permanent communities. The men building the Union Pacific Railroad were often Irish immigrants, and many were Civil War veterans of both Confederate and Union sympathies. They were young and often single, a combination that encouraged violence and the available vices. Besides the inevitable prostitutes, other female residents were teachers, actresses, laundresses, cooks, and hotel operators, but women were still few in number. 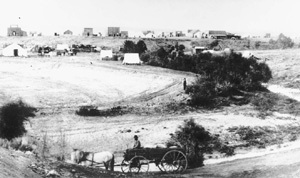 The first "Hell on Wheels" town began near Fort Kearny, Nebraska Territory, in August 1866, when the Union Pacific line met Dobeytown, a settlement that existed to provide for the soldiers' more earthy needs. Fort Kearny (later just Kearney) and North Platte, Nebraska; Julesburg, Colorado; Cheyenne, Laramie, Green River City, and Benton, Wyoming; and Bear River City and Corrine, Utah, were among the primary towns. A Hell on Wheels town was founded when the line of the railroad became apparent. At that point, merchants, aided by information provided by railroad officials, and the more enterprising residents of the last town moved to establish a community they hoped would be permanent but was usually temporary. Within a few weeks, residents of the last town would follow, leaving behind a small number of people who hoped to found a permanent city–North Platte declined in this manner from a population of a few thousand to less than 200. Sometimes departing residents left only trash and mud chimneys behind. The new community sprang to life as merchants of everything from the mundane to the scandalous quickly set up shop to receive the workers they knew would soon arrive. Town populations could rise from zero to thousands within a few days. Few permanent structures were built in the towns. Most were tents with possibly a wooden front wall to give the appearance of solidity. Others were prefabricated and crude, designed to be taken apart and put together rapidly. Only in towns like Cheyenne, which had been earmarked as a repair center, did lasting buildings rise. The towns provided virtually every service a construction worker might want, from dentistry and legal advice to gambling and prostitution. Saloons existed in large numbers. A tent more than 100 feet long, known as the "Big Tent," provided one notable place to drink and gamble as it followed the line. Dance houses provided relatively wholesome contact with women, while houses of prostitution also thrived. Vice was lucrative and found a ready market. Merchants along the line made large fortunes, providing goods not only to residents of the towns but also to military posts and the established city of Denver. Large capital-intensive firms, such as dry goods and banking concerns, followed the line from bases in Denver, Chicago, and Omaha. Freighting companies worked to connect the cities on the line with Denver and with towns ahead of the track. Some towns, including Cheyenne, featured multiple newspapers, but most had only the "Press on Wheels," otherwise known as the Frontier Index, which followed the line from Fort Kearny to Bear River City. While the towns violated the sexual and moral codes of the era despite the existence of law enforcement officers, quasi-legal and legal courts, and several vigilance committees, there was far less violence and open disregard for convention than has been supposed. Newspaper accounts show that while fights and killings did occur, they did not do so on a daily basis, despite repeated references in the historiography to phrases like "a man for breakfast." The traditional view that the towns lasted only one or two months is only correct for the later towns, built when the speed of construction was greatest. Several towns endured, including Kearney and Julesburg, both of which had already existed in some form, and Cheyenne and Laramie, which were chosen by the Union Pacific for repair facilities or terminals of branch lines. Others, including Bear River City, disappeared, leaving behind little more than a lingering reputation. The Union Pacific's Hell on Wheels towns seem to have been a unique phenomenon. They did not exist on the Central Pacific Railroad, which was built to meet the Union Pacific from Sacramento, California, to Promontory Point, Utah. The largely Chinese workforce of the Central Pacific was less violent, drunken, and ill behaved than that of the Union Pacific, and the builders of the Central Pacific appear to have exerted far greater control over their line. The contemporaneous Union Pacific–Eastern Division (later the Kansas Pacific) likewise was not known for producing wild construction towns. There were previously existing towns, however, such as Wallace and Hugo, Kansas, that provided similar services. For the builders of the Union Pacific these towns were necessary–supplies and workers needed to be organized in convenient locations. The theft of Union Pacific property, attempts to squat on company land, and the atmosphere of violence and disorder, however, made the towns an example no other line would follow.